HOUSTON (NASA & Roscomos PRs) — Traveling about 252 miles over Algeria, the unpiloted Russian Progress MS-10 cargo ship docked on Sunday at 2:28 p.m. EST to the aft port of the Zvezda Service Module on the Russian segment of the International Space Station. The Progress MS-10 ship delivered about 2.5 metric tons of various cargoes: more than 1.3 tons of dry cargo, 725 kg of fuel in the refueling system tanks, 420 kg of water in the Rodnik tanks, and 50 kg of compressed air and oxygen in cylinders. In the cargo compartment there are scientific equipment, components for the life support system, and containers with food, clothing, medicines and personal care products for crew members. Progress 71 will remain docked at the station for more than four months before departing in March for its deorbit in Earth’s atmosphere. 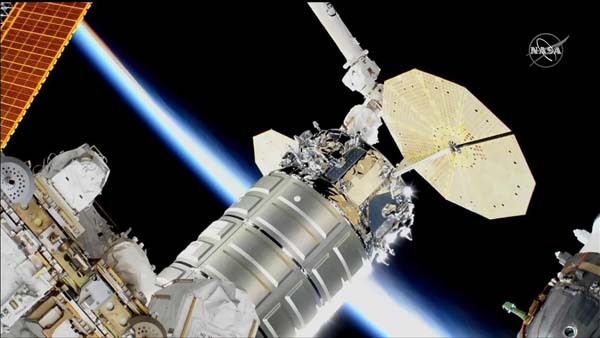 The Northrop Grumman Cygnus cargo ship was bolted into place on the International Space Station’s Earth-facing port of the Unity module on Monday at 7:31 a.m. EST. Changes in sensory input in microgravity may be misinterpreted and cause a person to make errors in estimation of velocity, distance or orientation. VECTION examines this effect as well as whether people adapt to altered sensory input on long-duration missions and how that adaptation changes upon return to Earth. Using a virtual reality display, astronauts estimate the distance to an object, length of an object and orientation of their bodies in space. Tests are conducted before, during and after flight. The investigation is named for a visual illusion of self-movement, called vection, which occurs when an individual is still but sees the world moving past, according to principal investigator Laurence Harris. The Canadian Space Agency (CSA) sponsors the investigation. The MVP-Cell 05 investigation uses a centrifuge to provide a variable gravity environment to study the complex process of cement solidification, a step toward eventually making and using concrete on extraterrestrial bodies. These tests are a follow-on to the previous studies known as Microgravity Investigation of Cement Solidification (MICS), which studied cement solidification in microgravity. Together, these tests will help engineers better understand the microstructure and material properties of cement, leading to design of safer, lightweight space habitats and improving cement processing techniques on Earth. This investigation is sponsored by NASA. Much of the universe was created when dust from star-based processes clumped into intermediate-sized particles and eventually became planets, moons and other objects. Many questions remain as to just how this worked, though. The EXCISS investigation seeks answers by simulating the high-energy, low gravity conditions that were present during formation of the early solar system. Scientists plan to zap a specially formulated dust with an electrical current, then study the shape and texture of pellets formed. Principal investigator Tamara Koch explains that the dust is made up of particles of forsterite (Mg2SiO4), the main mineral in many meteorites and related to olivine, also known as the gemstone peridot. The particles are about the diameter of a human hair. The CASIS PCG-16 investigation grows large crystals of an important protein, Leucine-rich repeat kinase 2, or LRRK2, in microgravity for analysis back on Earth. This protein is implicated in development of Parkinson’s disease, and improving our knowledge of its structure may help scientists better understand the pathology of the disease and develop therapies to treat it. Crystals of LRRK2 grown in gravity are too small and too compact to study, making microgravity an essential part of this research. Membranes represent one of the most energy-efficient and cost-effective technologies for separating and removing carbon dioxide from waste gases, thereby reducing greenhouse gas emissions. CEMSICA tests membranes made from particles of calcium-silicate (C-S) with pores 100 nanometers or smaller. Producing these membranes in microgravity may resolve some of the challenges of their manufacture on Earth and lead to development of lower-cost, more durable membranes that use less energy. The technology ultimately may help reduce the harmful effects of CO2 emissions on the planet. Cygnus will spend about three months attached to the space station before departing in February 2019. After it leaves the station, the uncrewed spacecraft will deploy several CubeSats before its fiery re-entry into Earth’s atmosphere as it disposes of several tons of trash. Learn more about station activities by following @space_station and @ISS_Research Twitter as well as the ISS Facebook and ISS Instagram accounts.